The Green Glog – March & April! Welcome to this first Green Glog! Here’s a small look at what we’ve been getting up to this spring at the Guild! For those of you who attended, the Food and Vintage fair was a fabulous success! Squash Nutrition, Groundwork, The Whitechapel Centre, Hope University and a smashing collection of societies (LUMOES, VegSoc, FemSoc) were involved! Squash Nutrition’s fruit juice time machine received attention, which boded well for gaging our students interest in our soon to be student led smoothie bar! The Free Shop was also a great success, some students walking out with a brand new high street outfit! Check out the collage of events from the day below. Green Guild Give it a Go sessions continue to be on point as we got to grips with making our own vegan skin care products. Students had the chance to make a shea butter and sweet almond oil body moisturiser, a flaxseed and caster sugar face scrub and essential oil body sprays! As if this wasn’t enough, we collaborated with Hope Universities’ Environmental Science students to create some ambiance with an aromatherapy work station! Student’s left feeling positively nourished, with the skill set and inspiration to make their own animal cruelty free cosmetics that are kind to the environment. Escaping the city is always a welcomed treat – this time we led our students over the water to Ness Botanical Gardens for a fun day out. 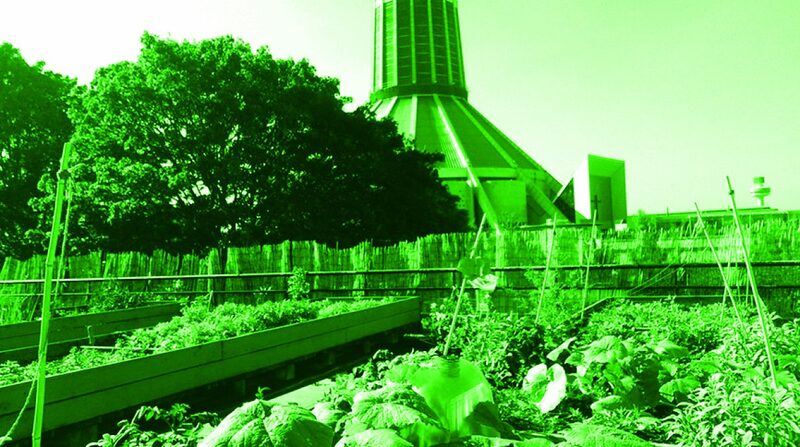 Ness Gardens are an affiliate of the University and a fantastic wealth of knowledge and resources used by Green Guild. For example, recently providing us with heaps of organic material to construct our Hugelkultur mound! If you are like us and love the scenery below, then student entry is only £1 if you want to make your own way there in the future. The Hugelkultur project, which consists of wood and organic debris (logs, leaves and compost) piled high into a self-sustainable growing system, fuelled by the microbial breakdown of the organic material, is developing nicely! Tremendous work by our volunteers means our two mounds have been constructed and are soon to be planted on! There is plenty more to do, including the best bit of sewing and harvesting. So if the Hugelkultur is something that takes your fancy, please get in in touch with Luke to become part of our volunteering team. Our monthly bike ‘fix-it’ workshop ran by Peloton returned on Wednesday the 26th of April between 12-3pm. Following huge interest and popular demand – our introduction to beekeeping course returned for round two on the 26th April! Our two Green Schools; Whitefield and Holy Name took part in the first ever Schools Conference on the 27th April 2017! Whitefield Primary and Holy Name Primary are both starting their own green projects at their schools which Green Schools’ volunteers have previously visited to help with planning. Holy Name’s project focuses on the school buying and planting their own living wall to make a greener playground whilst Whitefield are refurbishing their bug hotel and hopefully building a greenhouse. Look out for opportunities to get involved on our website over the summer! Pop up and see us, the bees and the Rooftop Garden anytime! We are on the 1st Floor of the Guild. Green Glog Powered by WordPress.com.